Hello all, I picked up a 69 NSU 1200 which I robbed the engine and trans for my 64 1000, I am left with a rather nice body,disc brakes and an empty engine bay. I have an 1835 with an IRS trans that seems like a reasonable swap. I have searched here and the net and have found reference to this being done but no pics or tech data. I was thinking a type3 cradle swap at first, but the NSU 1/2 shafts seem very adaptable to IRS VW. It looks like a front trans mount/rear "mustache bar" engine cradle ( like 68-71 Bus) should do the trick. I will get some pics soon. Lets talk NSU, the red headed stepchild of the VW family. Thanks in advance!! Drivin' a split and a fat chick!! Well the NSU 1/2 shaft diameter and the Bug IRS 1/2 shaft diameter seem very close. That part of the swap will go well w/ good measurements. I will get more pics soon of the engine compartment, I am leaning more towards a trans cradle mount, a trans front mount and the moustache bar in the back since I do not have the factory "horns" to hold the 1835 in place. I will not go dual carb or hot exhaust, just pict34 and stock exhaust. I don't want to rip the car apart. The car has a factory front mount for the trans and a moustache bar in the very back. Shifter is very similar "slider" just a bit offset. The patina on your car is fantastic! By the time a car looked like that where I live, you would need a brush and shovel to move it!! Sorry I can't give you any technical help,but good luck with the build. Well I figured the rear mustache hanger from the type4 (72 only) will adapt nicely to the NSU hanger so my rear mount is figured out more or less. The front trans mount looks like it will hang on a box area that handles the heating duties on the original set up. So I just have to figure out the middle trans mount that would normally attach to the horns,they will have to be modified to mount off the side to the body. I will get a rough mock up and then post a pic,not much to show yet. The NSU body is very light and is the unibody design...no pan for strength, so I am worried about tweaking the body. Luckily the car is rust free. Looks like things are coming together. 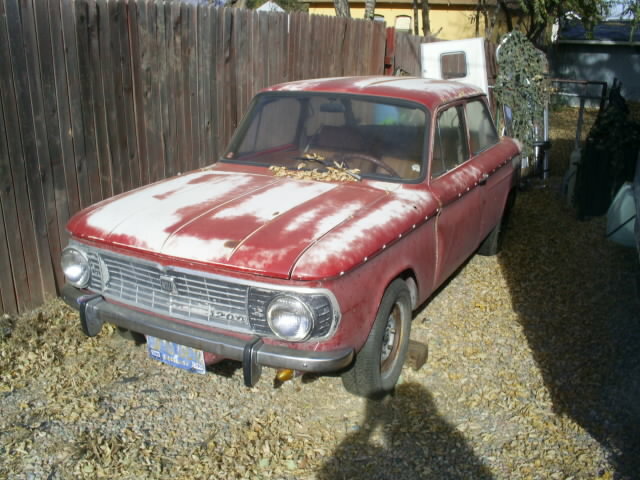 here is a pic or 2 , car is out of California and rust free. Has a super cool GASS sticker (German Air Sucker Society)! 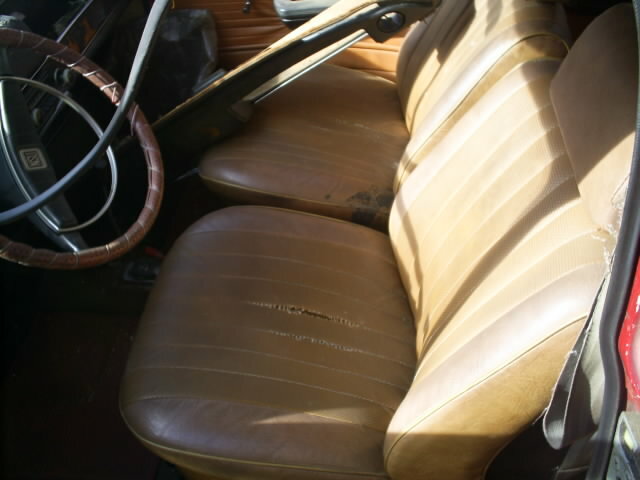 Comfy interior,I am 6'6" 270 lbs and I fit in it fine, Car has disc brakes on 13" rims,divers rear corner is smashed,luckily I have replacement panels I also will be grafting in 78 Nissan 200SX tail lights they fit the curve perfectly and I can not find stock replacement parts. I will probably flair the rears and get the widest tire on that the rims can handle. Gotta keep this machine on all 4's!! I will start assembling the 1835 next week so that I can do a mock-up. pre-measurements look encouraging. Lots of room to work with. More pics and observations later. NSU's of this type are friendly to work on..so far! 6'6" tall! Is there enough room for you in the car? If It doesn't fit you,I'm only 6'2" so you can post it to me. The Interior looks in good nic too? It's a shame you can't find rear lights though. I will keep my eyes peeled for some over here if you like? Thanks Alan for the German E-bay link, I speak German so I think I can get through the process. This car has the 3 round tail lights,those are the Euro style,however I think there is a "punch-out section" on the rear apron,I will take a close look. I do prefer to keep cars as stock as possible. 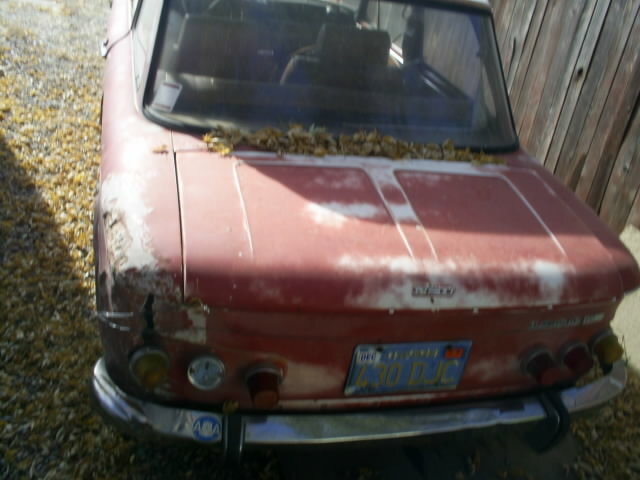 Getting NSU parts in Colorado is strictly a mail order affair. I will post a pic of me next to and in the car this week..should be a good laugh,but I really do fit O.K.I will also get a pic of my 64 1000,it is in nice shape from Hawaii..some rust repair had to be done. Just had my local locksmith make a key for it, he could not find any info, turns out to be a VW blank, so no problem. I may have time for a test fire,has not been run in many years (now complete thanks to 1200 donor). Stay tuned! I was thinking it had three seperate lenses. I don't ever remember seeing a single piece lens like the one on evilbay before! I'll keep looking for you,as you're right it would be far better with the round lenses. Good luck with the engine. Will be great seeing the 1000 pics too. Parts are a real challenge and pricey. The Danes have almost everything one would need if you can afford it. From an engineering/mechanics stand point they are very nice to work on and thoughtfully constructed. The 69 was originally a donor for my 64...then I had this 1835 lying around and the 69 was not that bad of a car. These little cars grow on you fast, I initially despised the corvair type styling, now I kind of like it. I saw the pic of the one by your truck..hope it got a good home. O.K. I'm sure 1 or 2 of you are on the edge of your seats as to the progress on this. I found a local fabricator to help get the mounts tacked in for the trans install and I miraculously found 2 13" rims on evil-bay so now I have 13" rims all around (came with 12" in the rear)..parts are oh so fun to find. I am dragging the whole mess to my warehouse so I can work indoors, My projects are so slow you need time lapse photography to notice any improvement! 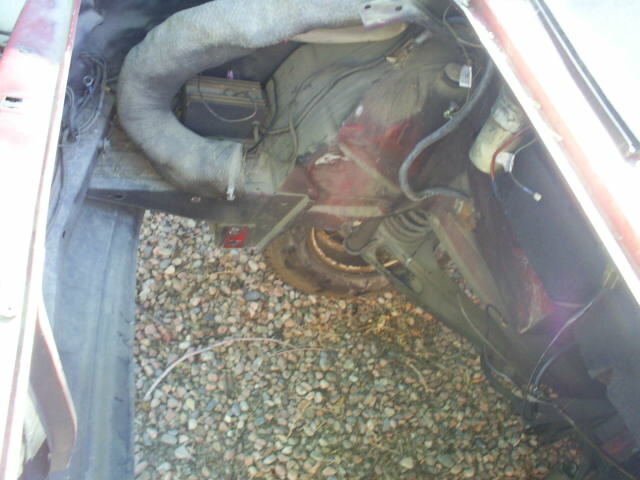 In my defense I have been resurrecting a "throwaway" 68 Bay window..
That thing is pretty cool man, more picures as you go. What was the original motor? It originally had a transverse I-4 overhead cam 1200, aircooled. Excellent engineering overall with very cute individual rocker covers. I was watching the movie Two Lane Blacktop yesterday and there is a great shot of one in racing form parked at the 1/4 race track at Lakeland. Rotten weather last week, I will get it inside this week and mock the trans up for some measurements.